Keep on Food Truckin' | Mealtime | Kids VT - small people, big ideas! A truck pulling a trailer decorated with images of bees, fruit and veggies has been trundling around Burlington this summer. This particular mobile eatery is different from the rest of the food trucks rolling into town: Kids run it. 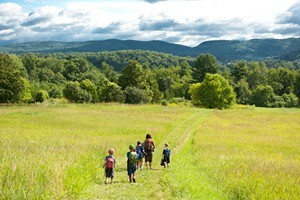 Meet Fork in the Road, Vermont's tastiest new example of sustainability education. 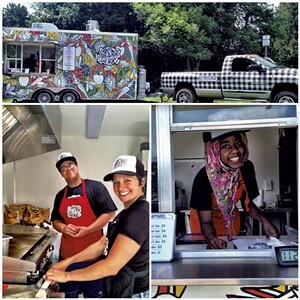 The food truck — painted by local artist Abby Manock and paid for by a grant from Dealer.com — features ingredients harvested by Burlington high school students. And the cuisine? The teens prepare it all. The venture is part of the Burlington School Food Project, run by Jenn McGowan and Sarah Heusner. Together with Will Gowen, an AmeriCorps farm-to-school educator, they manage 10 high school students, all of whom earn minimum wage for their work through the Vermont Department of Labor. Any profits flow back to the project's coffers. According to McGowan, it's one of the best minimum-wage jobs around. "I think the students are really, really proud of themselves," she says. "They feel really good about how visible and flashy the program is. And they have a lot more ownership than you'd have working at a TJ Maxx or Price Chopper." Culinary students at Burlington Technical Center spent last semester conceiving and testing the Fork in the Road fare. But only some of the teens working the truck's prep or grill stations are in the culinary program; the rest are BHS students. The eatery showcases local ingredients, but don't expect health food. The students focus on serving up dishes that are easy and inexpensive to make. The kid-friendly bill of fare includes hot dogs from North Hollow Farm in Rochester and grilled cheese sandwiches crafted from Cabot cheddar and O Bread Bakery loaves. 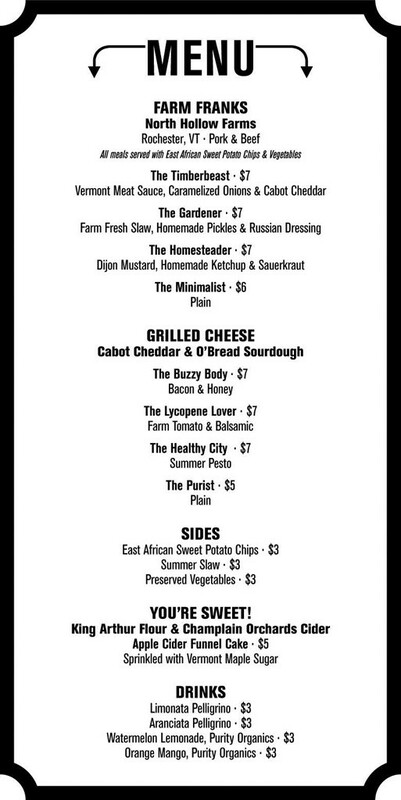 The Gardener hot dog is topped with homemade slaw and pickles, while the Healthy City grilled cheese is spread on both sides with a pesto made from BHS' own arugula. The high school's beets show up in a pair of desserts. A fluffy, lightly spiced cupcake gets its moisture from the veggies, and a meltingly tender brownie is tinted red. The diversity of the staff shows through on the menu, too. Sandwiches come with a side of East African sweet-potato chips. And the crew recently started making Nepali and African samosas. The kids cooking for Fork in the Road come from as far away as Africa and as close as North Avenue. Keshav Pokhrel moved to Burlington from Nepal in April 2012. Since enrolling at Burlington High School, the 15-year-old has unearthed a love of gardening. "I've always liked cooking," he says. "I learn from the TV. I try something I see and then I keep trying until I get it right." Pokhrel isn't sure whether a culinary career is in his future, but he's enjoying working with food right now — especially cooking grilled cheese. Each Monday and Tuesday through the summer, the Fork in the Road kids get their hands in the dirt, nurturing and harvesting beets, leafy greens, cabbage and other veggies. They spend time in school gardens all over Burlington, including Hunt Middle School's Healthy City garden. The cooks had planned to use honey from the Rock Point School apiaries for the Buzzy Body grilled cheese, which also features bacon from Brault's Market in Troy, but the BHS student farmers ate all the sweet stuff before it could be sold. Other local schools will provide more produce as their gardens grow. C.P. Smith Elementary School, with its apple, pear, peach and plum trees and patches of raspberries, blueberries and strawberries, will make Fork in the Road's cuisine even sweeter. 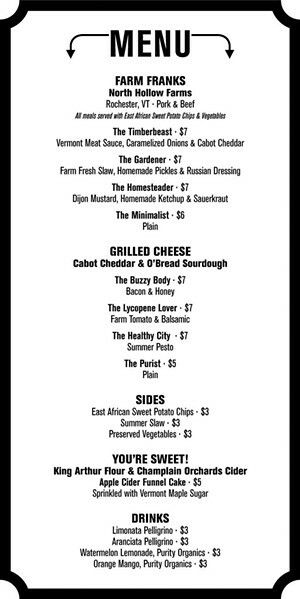 Find the Fork in the Road truck at various Burlington locations, including Oakledge Park, the Intervale Center and Burlington High School through the summer. Check the kids' Facebook page — facebook.com/forkintheroadvt — to find out where they're stopping next.